If you’ve been following the real estate market, the latest headlines regarding a market shift can be unnerving. While the market is definitely in transition, the data —at least in our zip code — shows a healthy, more balanced market. Good news for sellers: homes continue to increase in value. Good news for buyers: the choices you have been waiting for are finally out there. These numbers show our market is good for both buyers and sellers. For buyers, a more balanced market provides fewer bidding wars and more time to make thoughtful decisions about their purchase. For sellers, even though homes are on the market for a bit longer and the sale prices are slightly below the list prices, the average sale price has actually risen in 98112. In the last five years, Madison Park has seen the average sales price of a home increase 59 percent, to $1,420,000 in 2018, and the days on market drop from 64 in 2013 to 19 in 2018. Real estate has proven to be an excellent investment for homeowners in our neighborhood and, according to all indicators, will continue to be a sound bet. In the high end, the market data shows somewhat similar results to the market as a whole; days on market are up, with only a nominal adjustment in the average sales price year over year. 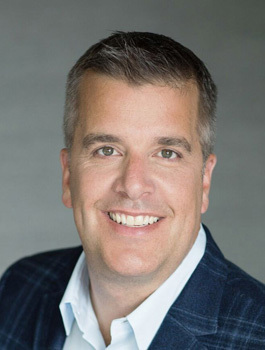 • The highest listed sale was $5.875 million at 1824 Broadmoor Drive E.
• The highest sale in King County in 2018 was an unlisted property in Washington Park for $12.5 million. As the home of Microsoft, Starbucks, Amazon and myriad booming tech companies, our real estate market is employment driven. Washington’s unemployment remained at 4.3 percent in December, which was the third consecutive month at an all-time low. The series extends back to 1976. In December 2017, the Washington unemployment rate stood at 4.7 percent. Madison Park continues to be a big draw for house hunters. Buffered by Madison Park Beach on one end, and the Washington Park Arboretum on the other, our neighborhood offers a beautiful natural landscape, as well as a vibrant business district. One trend our brokers continue to see is the desire for walkable neighborhoods. Having shops, coffee, cafés, fine dining and pubs within strolling distance is a valuable asset for the Park. While many of our residents work in the city or on the Eastside, when they get home in the evenings, they appreciate the opportunity to find everything they need in our neighborhood. Let’s continue to support our local businesses. 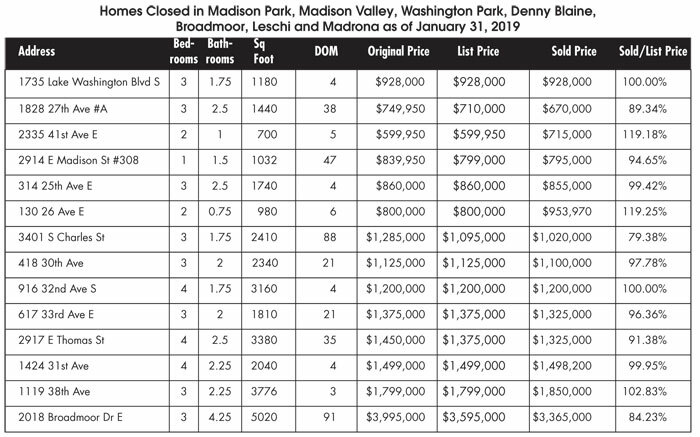 As of press time, there are 17 homes for sale in Madison Park, Washington Park and Broadmoor. The highest is at $15 million for a Washington Park view estate, and the lowest is a waterfront condominium offered at $555,000. With the spring selling season soon upon us, we believe the market will remain strong, and are beginning to see the typical surge of spring buyers that will likely surpass the increase in listings. If you have given any thought to taking advantage of the continued strong market, now may be the time for you to make your move. Our Compass experts have a long history in Madison Park, and are ready to help you navigate this market to your advantage with the latest technology, top-notch marketing, and proven pricing strategies. If you’re buying, our knowledgeable and savvy agents will help you achieve success in this still-competitive market. Evan Wyman is a managing broker at Compass and a Madison Park resident. Reach him at evan.wyman@compass.com.